For the most part, the current interface in NBA Live’s Franchise mode is serviceable. However, it would benefit greatly from returning to the daily calendar interface that has been the standard in most franchise modes over the past twenty years. I have to admit that until I dug a little deeper, I didn’t know that it was possible to bring up the old calendar; it’s the “Advance Further” option, and it’s kind of clunky to get there. You also can’t sim days where you don’t have a game scheduled, or even view the boxscores, scheduled games, and results from those days. The box score screen is also quite limited and poorly organised. It’s hard to keep up with the rest of the league. I’ve heard that this approach was borrowed from Madden, and frankly, I feel that was a bad idea. It may work well with the NFL where teams are playing one game a week, but it’s not suitable for the NBA where teams are playing up to four or five. If nothing else, it means a lot of basic functionality that we’ve had for years in terms of viewing daily scores, stats, and schedules, is no longer available to us. 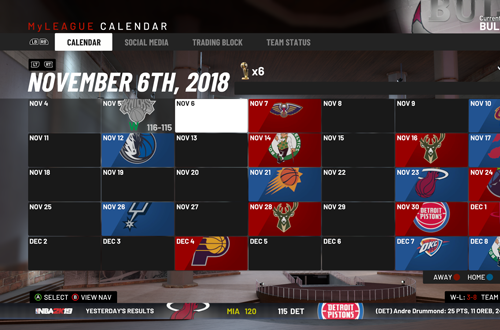 Franchise modes are about the entire NBA as much as they are the team we’re controlling, so we should be able to advance day-by-day, as well as simulate the current day and perform tasks on off-days, instead of only being able to advance to our next scheduled game. One of the strengths of MyLEAGUE in NBA 2K is the ability to deeply customise the franchise experience on offer. Much of that depth has since been added to MyGM as well, though if you prefer the traditional sandbox experience to a story-driven one, MyLEAGUE is still the way to go. I feel that NBA Live’s Franchise should be more along the lines of MyLEAGUE, and while it will take some time to get to that level, NBA Live 20 should take the opportunity to make a start on it. What we need to have are options that give us access to the core aspects: frequencies, tendencies, maximums and minimums, modifiers, simulation logic, and so on. Basically, we need the Franchise equivalent of gameplay sliders. MyLEAGUE has steadily introduced more and more control over the experience, and that’s what NBA Live’s Franchise mode needs to do as well. By all means tune the default sliders so that most gamers don’t need to touch them, but if you’re not happy with trade logic, injury frequency, player progression, Draft Class quality, or any other aspect of the mode, sliders would allow you to make adjustments accordingly. Having options to normalise statistics while playing shorter quarter lengths, enable and disable injuries without entering gameplay, and automate GM tasks, are also a necessity. While online multiplayer is far more popular these days, basketball games still need to cater to local multiplayer as well. My cousin and I used to play cooperatively in our franchise games, but I know there are other gamers who would prefer to each control their own teams and go head to head over the course of a season. In other words, the same experience NBA 2K offers with MyLEAGUE Online, only locally. There are also times when a single user may want to control multiple teams, and switch between them throughout the season. If nothing else, there are times when the user may want (or need) to intervene on behalf of CPU-controlled teams, and modify the league. 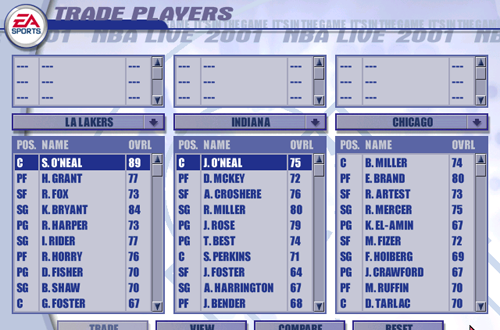 In NBA Live’s original Franchise mode – the one that was present in NBA Live 2000 through NBA Live 2003 – it was possible to control more than one team. The revamp into Dynasty mode in NBA Live 2004 introduced the approach of being locked to one team, and while it makes sense conceptually, it’s also very restrictive. 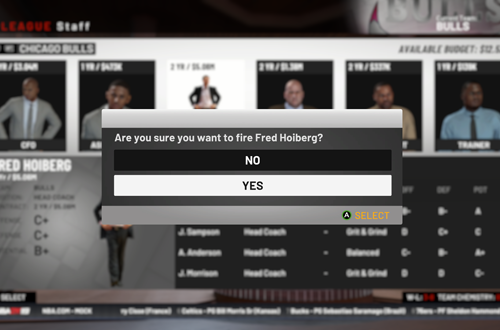 NBA Live 10 offered the ability to modify CPU teams in Dynasty mode, but doing so forfeited XP for staff development, and gamers have reported it having a weird influence in other ways as well. Ideally, we should be able to control any number of teams in Franchise, and have some intervention/commissioner options to fix, veto, and modify as desired. It’s tough to say which is more frustrating in a long-running series of video games: the legacy issues that have lasted through many releases, or the absence of features that we once enjoyed. I suppose that the latter is an example of the former, particularly in the case of NBA Live’s Franchise mode. Although NBA Live hasn’t been nearly as innovative with its franchise modes as NBA 2K – more on that in a moment – it has added some nifty features over the years. Unfortunately, many of them have since fallen by the wayside, with the reboot in NBA Live 14 shedding a few features and functions that left the new versions of Dynasty and Franchise mode feeling very thin. Failed ideas should be left in the past, but successful concepts need to be reworked for the current generation. I’ve covered one example of an old feature above, but I must also mention features such as the trade block, retiring numbers, the drills from the NBA Live Academy, rookie scouting during the season, a rumour mill, progressive fatigue, the free agent negotiation mini-game, standalone league leaders screens that recognise qualifying stats, mock Drafts, and three team trades. 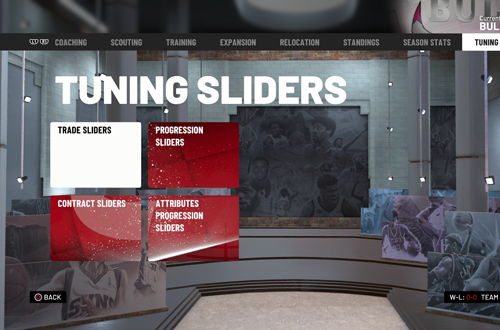 As much as EA needs to look at 2K’s exam paper and copy some ideas from NBA 2K’s franchise modes, dipping into its own past provides examples of features that need to be brought back. 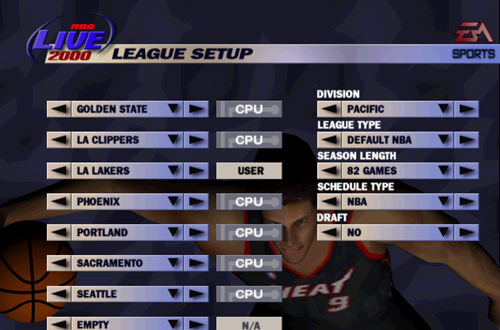 As I noted in a series of Wayback Wednesday articles, NBA Live was the first hoops game to introduce a comprehensive multi-season franchise mode. It was a huge deal when we finally got to experience that mode in NBA Live 2000, which is why it’s such a shame that EA never really built on it the way they should. Despite being the innovator of the experience, NBA Live’s Franchise and Dynasty modes quickly fell behind what NBA 2K was doing with Association, and more recently, MyLEAGUE and MyGM. Catching up to 2K is easier said than done and impossible within the span of just one development cycle, but every journey begins with the first step. This means adding features that have been overdue for a few generations now. To name a few: hiring and firing head coaches, customisable Draft Classes, ten day contracts, contract extensions and other elements of the CBA, G-League assignments, All-Star voting, restrictions on retired jersey numbers, league and team histories and records, free practice/scrimmage, and advanced stats with analytics tools. Many of these features have been in NBA 2K’s franchise modes for over a decade, and even showed up in the franchise modes of other games like the short-lived NBA Inside Drive series. It’s been a case of “next year” for far too long for many of these staples. What else needs to be done to enhance Franchise mode in NBA Live 20? Have your say in the comments section below, and as always, feel free to take the discussion to the NLSC Forum! That’s all for this week, so thanks for checking in, have a great weekend, and please join me again next Friday for another Five. Given a lack of changes in the mode, EA Tiburon may just afford to import game saves down the line to let gamers complete their 25 season journey the other year) San Diego Studio (MLB The Show) did it. I imagine it’s easier said than done, but it’d be great to be able to import saves and continue them in a new game.